Chapter 4 Page 4 is up. Sherbourg crowd sources its criminal justice. That doesn’t matter to Laurent. He’s pinning all the blame on Jassart. 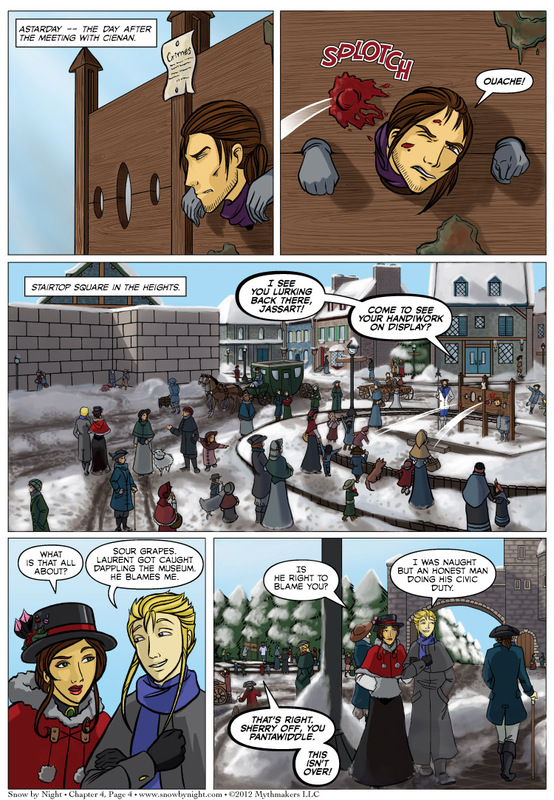 To see more of Mathilde’s and Jassart’s “date,” vote for Snow by Night on Top Web Comics. Pittsburgh Comicon was a great time. This convention treated its artists well. We got a draped-off area that gave us plenty of space. The con staff came by with water bottles and sandwiches. It was some incredible bang for our buck. We also met some great artists. Franks and Beans were our neighbors to one side. They run Wagon Wheel Comics and publish the engaging and fast-paced Teddy and the Yeti. To our other side was John Haun, a brilliant illustrator and sketch artist. Next to John was 8th Day Anime, who does some incredible anime illustrations. Oh, Stan Lee was there, signing his new Romeo & Juliet book. That booth was literally 50 feet from ours so I got a picture of him then watched as he walked by our table a couple times (he didn’t notice us, alas). For 89 years old, he’s in incredible health and owns whatever room he’s in. To see pictures of all this, visit our Facebook page. He can’t have done much as far as ‘crime’ and won’t be in pillory for more than a couple days. The ones who were pilloried for a longer duration would have their ears nailed to the stock and severed when they were released, and often be bruised or injured from being unable to move their head to dodge missiles including rocks and offal, and would sometimes even be minus clothing by release time. Short duration pillory inmates would often only be struck with rotted produce or other deteriorated food products and could still move a little. One story I heard about the pillory is that men would sneak behind the poor schlub in the stock and . . .
Ah yes the things we need Back In Use instead of courts for Everything.